This free app comes with 10 complimentary premium words and can be upgraded to over 220 via In-app purchase. Use as traditional flash cards quizzing from Latin to English or English to Latin, or explore other functions of the app, such as multiple choice drilling or memory games. File cards into “Know It” or “Study It” boxes and quiz yourself to test your progress. Vocabulary study has never been so easy or so convenient! 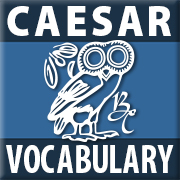 Each flash card contains (front) the Latin word, including principal parts for verbs and gender for nouns, as well as the part of speech and (back) the English definition. *AP is a registered trademark of the College Entrance Examination Board, which was not involved in the production of, and does not endorse, this product.